Introducing the Supersoft Slouch Dress, crafted from 100% Geelong lambswool and designed to be worn all year round; this wardrobe staple can be paired down for casual daytime luxe or styled up with the Toscana Vestfor an easy evening look. Match with leggings around the slopes and then switch them up for tights as you enter the evening, this dynamic piece will soon become your favourite holiday hero. Equally as stylish and wearable, why not pair the slouch dress with our Celt Knee High Boots or the Popper Knee High Boots? Super snug and completely effortless, these shearling boots reach a towering 43cm in length and add a standout touch to every outfit. Down to the temperature regulating properties of our finest quality British shearling, these boots will keep you both cool whilst dashing around the airport yet warm and toasty during those fresher days in the snow. 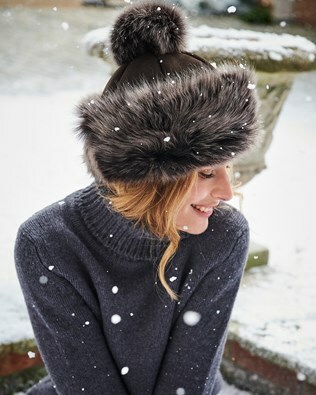 Finally, treat yourself to our super plush Toscana Pompom Hat designed to make you stand out from the crowd this spring, it's the easiest way to add a touch of glam in the cooler weather. 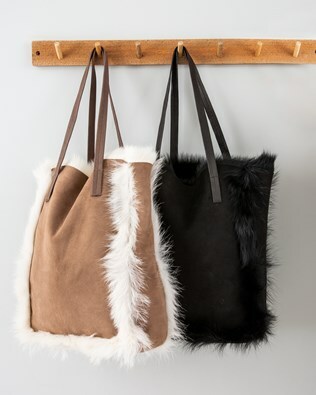 This luxurious hat features a flattering shearling cuff and playful pompom, to complete the look, style with the Toscana Shopper Bag; a super chic shearling twist on traditional accessories.